Ray Bradbury reads his poem "If Only We Had Taller Been" in this still from a NASA video shot in November 1971. NASA has released two videos from its archives to pay tribute to famed science-fiction author and space visionary Ray Bradbury, who died Tuesday (June 5) at the age of 91. The two short videos, which date from 1971 and 2009, were released Wednesday (June 6) and Thursday, respectively. 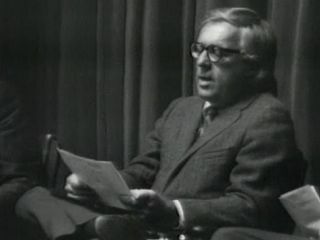 The older clip shows Bradbury at the California Institute of Technology in Pasadena on Nov. 12, 1971, participating in a symposium to celebrate the arrival of NASA's Mariner 9 probe in orbit around Mars the next day. It would have been nice to be in that audience, and not just because of Mariner 9's historic accomplishment (it was the first spacecraft ever to orbit another planet). Onstage with Bradbury were fellow sci-fi legend Arthur C. Clarke, journalist Walter Sullivan and scientists Carl Sagan and Bruce Murray. Bradbury rose to prominence in 1950 with the publication of "The Martian Chronicles," a book of short stories about humanity's colonization of Mars and our species' conflict with the native inhabitants of the Red Planet. Bradbury also reads a rousing version of his poem "If Only We Had Taller Been," which he says "sums up some of my feelings on why I love space travel, why I write science fiction, why I'm intrigued with what's going on this weekend at Mars." We’ve reached Alpha Centauri! We’re tall! O God, we’re tall!" The other NASA video tribute for Bradbury was recorded in February 2009 and retells the writer's visit to the agency's Jet Propulsion Laboratory in Pasadena to celebrate the success of the space agency's Mars rovers Spirit and Opportunity. The twin robots had just celebrated their five-year anniversary on the Red Planet. They landed in January 2004 on a mission to search for signs of past water activity that was originally supposed to last just 90 days. "Having Ray Bradbury here was incredible, because in particular for Mars, he really has been one of the voices from very, very early on for going to Mars and exploring Mars," rover driver Ashley Stroupe says in the two-minute video. "Long before we knew how to do it, he was taking us there in our minds." Bradbury visited the rover operation room, saw a life-size model of the twin robots and got to drive a simulated rover across the surface of Mars on a computer screen. "Letting him see the reality of that was very rewarding for us, because we could tell how much it meant to him to see this," Stroupe said. "That once it was only fiction, but partly because of his vision, and his sharing that vision with us, that it's now become a reality, and that we're actually there." Bradbury is perhaps most famous for the dystopian novel "Fahrenheit 451," but he wrote many other beloved books over the course of his long literary career, including "Something Wicked This Way Comes" and the nostalgic childhood novel "Dandelion Wine." Follow SPACE.com senior writer Mike Wall on Twitter @michaeldwall or SPACE.com @Spacedotcom . We're also on Facebook and Google+.